If your youngster has evolved from "Truck! Truck!" to "But how does it work? I want to know!" then I have a great non-fiction book suggestion for you. 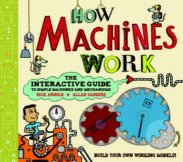 How Machines Work is a brilliant children's hardback book by Nick Arnold and Allan Sanders, produced by Quarto Children's Books and published by Walker Books (2011). It's more than a children's nonfiction book. It's also an interactive guide to simple machines and mechanisms, and provides parts and instructions for children to make their own 12 working models of the machines described. The book's recommended for kids over 8, and I think it would appeal to both boys and girls with a strong curiosity about the physical world and how it works. How Machines Work is a unique interactive guide to understanding simple machines and mechanisms. Each spread introduces you to a key mechanical principle that you put into practice by building one or more working models. This hands-on approach makes it easy to understand how these principles work and how they can be applied to everyday objects, such as cars, bicycles cranes and seesaws. Arnold has used a no-nonsense approach to what many would find a complicated subject. He doesn't pull punches or talk down to kids - he uses correct scientific terms like "cam" and "pawl". But the writing itself is not complicated. Arnold uses clear and simple language, honing in on salient points and allowing diagrams and illustrations to add some detail. Sanders' illustrations truly are perfect for the book. Colourful, clear and cartoon in style, they add humour to the subject matter. For example, there's a mouse on many pages, helping to explain. In the Egyptian picture, not only is the mouse helping slaves use a ramp to move a block, but one of the pyramids is mouse-shaped. Lovely to think we can add humour to non-fiction books nowadays! The work that's gone into How Machines Work makes my brain boggle. Paper-engineering has always fascinated me, and I really admire the quality of this product. The machine parts supplied inside the cover are sturdy cardboard gears, pinions etc and the plastic screws and nuts even have thread. I also love the way the book works as an informational text - there are clear diagrams and labels, a timeline of each machine along the bottom of its double-page spread and the short text explanations are great models for kids to read and imitate themselves. With an RRP of $Au24.95, I think this makes a great value gift for kids, and I can see dads and mums appreciating it too. Check out Susan's review of How Machines Work at KBR.